Let us travel back in time, 2 million years specifically, so we could apply to play at the prehistoric Bow Contest tournament. Pick your desired homo sapiens archer, choose the perfect stone-aged environment, decide will you play against the skilled cpu player or challenge your best friend, and have fun aiming and hitting the bullseyed marked area! 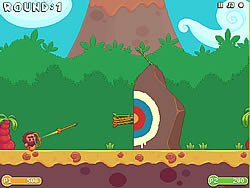 Aim carefully, keep your hand steady and have fun playing Bow Contest 2 players archer game!